Homesteads in South District, Salt Cay. 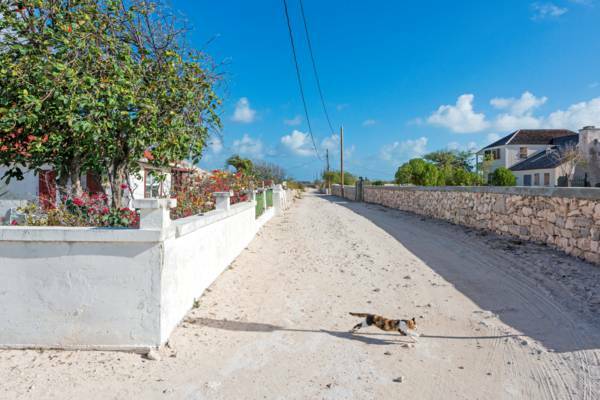 The quiet streets of South District, Salt Cay. South District is a small residential community on Salt Cay. Along with private homesteads and residences, the area is home to one small shop, Pat’s Place Restaurant and a few rental villas. Today, much of the population of this village (and Salt Cay in general) is elderly. When the island’s salt industry came to an end in the 1960s, the younger generation moved onto the better economic prospects of Grand Turk, Providenciales and the Bahamas. Such was also the case at several other previously-bustling settlements in the country, including Lorimers and Bambarra on Middle Caicos. Both South District Beach and the wetlands of South Creek are located in nearby. These coastal areas are beautiful and are fascinating to explore, but do not quite offer the spectacular beach and swimming conditions of North Bay. The causeway across Town Salina that connects South District to Victoria Street and Balfour Town. In the past, South District was largely home to the residences of the salt industry labourers. Eking out a living raking salt was a difficult life, and the lack of clean water certainly didn’t help. As was the issue on every island other than North Caicos, Middle Caicos and Providenciales, before the introduction of reverse osmosis water desalination, there were only two sources of drinking water: rain water collection and shallow brackish wells. Salt Cay was ill-favoured when it came to both. 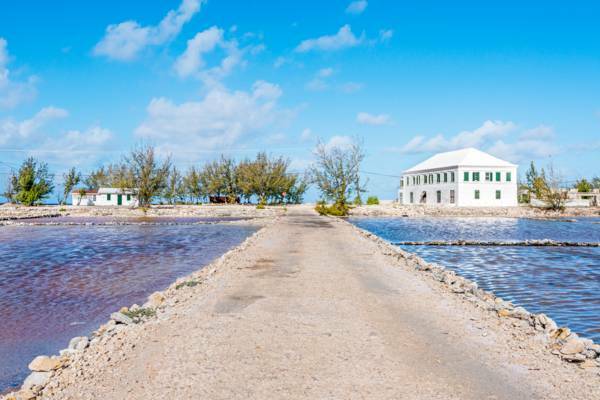 Rainfall averages for Salt Cay are lower than for any other island in the country, and the best wells on the island produced brackish water that was barely useable. Reliable fresh water storage (from rainfall) at the time required masonry cisterns, which were expensive to build, and many of the South District dwellings only got cisterns after the salt industry days came to a close. A study of groundwater sources in the Turks and Caicos undertaken by the British Institute of Geological Sciences in the 1970s found that salt content at wells in South District was 15,500ppm; about half as salty as ocean water and consequently undrinkable. 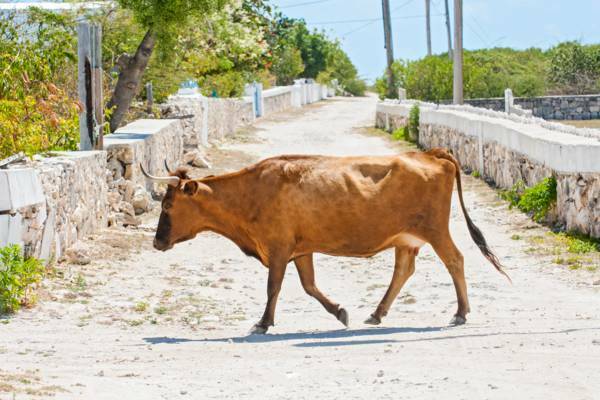 A hardy Salt Cay cow in South District.